1 Coins are easy to transport. You can put a few one ounce gold coins in your pocket. That’s very difficult to do with a 1,000 ounce gold bar. If it ever was necessary to flee the country, or even to go to the store to buy bread, coins are much easier to transport. 2 Coins are easy to trade. It’s easy for a coin dealer to assess the value of a one ounce Canadian gold Maple Leaf. A gold bar is more difficult to evaluate, since it may need to be weighed and assayed before a transaction can be completed. You can take a Canadian Maple Leaf, or an Australian Nugget, or an American Eagle into any coin store anywhere in the world and it will be instantly accepted. 3 Coins are easy to store. You need a special place for a 1,000 ounce bar, but gold coins can be stashed anywhere. 4 Finally, the transaction costs are lowest with coins. If you want to sell or trade a small fraction of your portfolio, you sell one or two coins. That’s impossible to do with a large bar. However, there is one big advantage when buying bars as compared to coins: you pay much less per ounce. If you live in Ontario, Canada, 8% sales tax is charged on the purchase of a coin (but not on bars). In addition, the premium charged on coins is higher. Here’s an example: On February 19, 2010 a 20 ounce gold bar was quoted, all in, at $24,327 Canadian, or $1,216.36 per ounce Canadian. The exchange rate was 1.07, so in U.S. dollars that’s $1,136.79 per ounce. The spot price of gold closed that day at $1,117.50, and was as high as $1,126.80 on the day, so the bars were trading at a premium of around $10 per ounce, which considering commissions and exchange isn’t much. 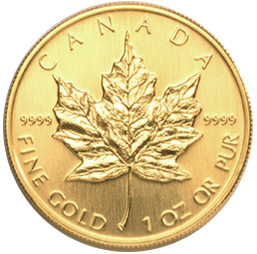 By comparison, a one ounce gold Maple Leaf coin (pictured above) on October 7, 2009 was $1,210 US, when the spot price was around $1,045 US, so obviously the premium on a coin is significantly larger than the premium on a bar. The premium over spot is $165, with the 8% sales tax on the coin representing $84 of the premium, leaving $81 per ounce in other premiums for buying a coin. A $10 premium on a bar is obviously much cheaper. So, if you want small quantities of precious metals, buy coins. If you want something you can carry with you when you flee the country, and can sell anywhere, buy coins. But if you want to buy larger quantities bars are a much less expensive way to go. Bars (or wafers) can be purchased in one ounce, 5 ounce, 10 ounce, 20 ounce and 100 ounce and 1 kilogram sizes, so you are only limited by the cash in your pocket. You have a number of choices if you want to buy gold or silver coins or bars. 1 Buy gold from a local coin or gold dealer. It’s convenient, and easy. 2 In Canada, Scotiabank is the largest gold and silver dealer. They have opened an e-store, through their ScotiaMoccatta subsidiary; orders can be placed on-line at their e-store. You can also go to their headquarters at Scotia Plaza in Toronto, and stand in line and take it home with you. You will need a Scotiabank account to pay for it, and you will need two pieces of photo identification. 3 Sprott Money also sells gold and silver on-line. They have larger order quantities that Scotia, and they will deliver to a home or business address. There are numerous other sources to purchase gold, so shop around for the most convenient option.